Marathon participation in the United States is booming. According to the most recent data from Running USA, participation in marathons grew nearly three percent from 2011 to 2013, which resulted in a record 541,000 marathon finishers in 2013. For comparison: In 2001, just 288,000 runners finished a marathon. Given these continually growing numbers, it's obvious that running the vaunted 26.2-mile distance is quickly becoming the de facto goal for many beginning runners. But, should finishing a marathon be your goal? How much running experience should you have? How many miles per week should you be ready to handle before you start training? Running a marathon can be done if you don't have the requisite training background, but it might not be the best goal for you, and it could stunt your long-term development. The first step is finding enough time to train. Beginners need at least four months of marathon-specific training to prepare properly for the marathon. A beginner is someone who has been running consistently for less than two years, or who averages less than 20 to 25 miles per week. There's nothing wrong with being a beginner or running low mileage. But, if your goal is to run a marathon, you need the requisite training background first. If the race you want to run is less than four months away, you might struggle to get in the necessary training and long runs. Squeezing in marathon training with just 12 or 14 weeks left before the race hardly ever works for beginners. They either get injured from trying to build long runs too quickly, or they have a miserable race experience. You need at least four months of marathon-specific training. The next step: build your mileage so you're ready to train during this 16-week block. So, what should your mileage and long run numbers look like before you begin your marathon-specific block of training? Beginners need to be able to average at least 30 to 35 miles per week for six to eight weeks during the marathon training cycle. This means that you need to be able to comfortably run 25 to 30 miles per week before you begin training for a marathon. If you're capable of maintaining this range, it doesn't mean you can never train for a marathon. Rather, you should focus on slowly building your training tolerance and mileage before you begin your 16-week marathon training cycle. Otherwise, you're probably going to struggle to increase the weekly mileage and long runs enough to be prepared on race day. 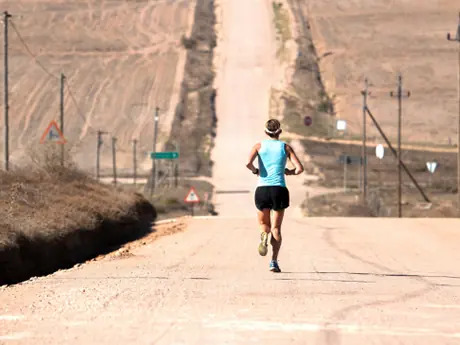 Beginners should follow a "three-week-up, one-week-down" philosophy where you increase mileage slowly for three weeks and, on the fourth week, take a step back and bring your mileage total back to the volume of the first week in the three-week cycle. For example, a beginner runner's mileage totals might look like this: 15, 17, 19, 15, 20, 22, 24, 20 until you build to your maximum mileage. For long runs, follow a similar approach. Try increasing long-run volume every two weeks or alternating between one week up and one week down. Here's an example: 10-mile long run, 13-mile long run, 10-mile long run, 14-mile long run, 11-mile long run, 15-mile long run, and so on. More: How Long Should Your Long Runs Be During Marathon Training? 1. First, the sharp initial increase in training results in a small injury that sets you back a week. Remember, your aerobic system develops at a faster rate than your muscles, tendons, ligaments and bones. So, while you might not be winded while running, your muscles are still struggling to adapt. 2. To make up for missed time, you begin to push the envelope with your mileage and long runs in order to get back on track. Unfortunately, this typically leads to developing another small injury. 3. The cycle repeats throughout the entire training segment until race week, when you realize you haven't put together a solid month of training since you started your training plan. In the end, this dreaded cycle not only ruins your chance at having a great race experience, but it also deters your long-term development. Instead of spending the previous three to four months slowly and safely building your mileage and aerobic system, you spend three months mostly injured, and your body is no further along in its adaptation to training. More: When Does Running Get Easier for Beginners? How Should You Approach Training? The best approach to preparing for a marathon as a beginner is to do what coaches call "taking the next logical step in your development." Rather than concentrating on a specific goal event like the marathon, focus instead on preparing your body to handle the training demands for that distance. Then, once you're ready, start planning to train for the marathon. Each week, focus on taking the next logical step in your development. That could mean slightly bumping your weekly volume, adding running-specific strength work to prevent injuries, or increasing your long run. The idea isn't to try and hit specific numbers by a specific date, but to increase your volume and training only as much as your body is ready to handle. When your training is based on your current fitness level rather than on a specific race date, you can listen to your body better, and stay healthy. By approaching your training with this mentality, you're able to listen to your body and take the small steps needed to increase your mileage and paces without getting injured. When you've reached a training level that allows you to run the necessary long runs, mileage and workouts for a good marathon, you can set the date, then start your marathon training. With the extreme popularity and accessibility of marathons these days, it can be hard to forgo the temptation to race one when you're not be ready. However, if you're a new runner, you should look closely at your training and goals to determine if running a marathon is the right choice for your long-term and short-term development. The better choice is to train based on your current fitness, take the next logical step in your development, and keep your focus on the process. You'll train more consistently, stay healthy, and make progress week after week, month after month. Soon enough you'll be ready to have a great marathon experience.